Monster Magnet is unique blend that it is one planting that will benefit growing bucks and nursing does throughout the summer, yet still provide critical nutrition and attraction during the hunting season and cold winter months. Best planted late Spring, Monster Magnet is an all season mix of annuals and biennials that is a high nutrition smorgasbord for your deer. 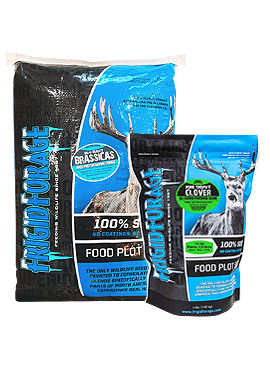 Contains forage soybeans and forage peas along with turnips, radishes, and annual clover. A proven blend that offers protein levels up to 40% for building a larger bodied and larger antlered deer herd. Deer will seek out the clover, forage beans, sunflowers, and forage peas early on and then come back for the brassicas late into the year. A great way to provide both nutrition and attraction throughout the entire season in one planting. Contains: Spring forage peas, forage soybeans, sunflowers, rye grain, crimson clover, common vetch, forage turnips, sugar beets, and Daikon forage radish.